Highly popular in the rental market, Avolite Sapphire 2004 features electronic legends, dedicated theatre playback and comprehensive theatrical-style plotting and playback tools. Avolite Sapphire 2004 is optimised for live control as well as theatre and musicals with large moving light rigs. The console offers many time saving dedicated features for the individual needs of television, concerts and industrial presentations. The Avolite Sapphire 2004 is a powerful, streamlined, stylish console offering 2,048 channels and 100 pages of 20 playbacks. It also offers electronic legending, showing page contents and preset focus palette on both desk and VGA monitor. Avolite Sapphire 2004 represents the third generation of Rolacue consoles. 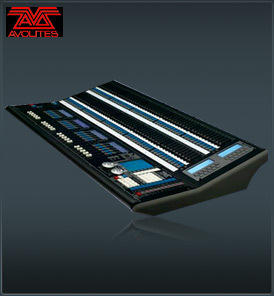 The console comes with a hundred pre-programmed moving light effects via the Avolites Shape Generator. This phenomenally powerful function makes complex movement, colour and gobo patterns immediately available to moving light programmers. The once characteristic roller is now replaced with high-resolution graphic displays. Avolite Sapphire 2004 is presented in a modern re-styled, sleek format for the 21st Century. Avolite Sapphire 2004 has the ability to control hundreds of multi-parameter fixtures and DMX effects. Another powerful, new and unique feature of Avolite Sapphire 2004 is the Electronic Palette, offering 200 entries containing colours, positions, gobos, etc., all with their names electronically displayed. The 120 fixture select groups allows the programmer to instantly select moving light fixture groups, e.g. 'Front truss scans', 'back truss', 'all odd', 'all even', etc. One hundred preset faders offer instant dimmer and fixture access, each with its own Add and Swop buttons. Twenty playbacks have the benefit of electronic labeling which display playback contents and timefade stack cue numbers. Playbacks also have the ability, via a dedicated button, to pre-load a state before the fader is raised and the intensity activated. The Avolite Sapphire 2004 offers comprehensive theatre plotting and playback. The combination of the three playback faders gives easy hands-on control of fade-in, fade-out and LTP fades. These fades can then be triggered individually or using a common 'Go' button. Manual override is possible at any time by moving the fader. Avolite Sapphire 2004 is fully integrated with the Avolites Focus Finder and stage Visualiser. Offering the most powerful creative programming tools to modern lighting designers, Avolite Sapphire 2004 remains simple, intuitive and familiar to operate. Shape Generator for complex waves, fans, ballyhoos, etc. Theatrical programming and playback styles. Multiple Sound to Light Triggers. Fully compatable with Avolites Graphics tablet.